Gunnery Sergeant Hartman (R. Lee Ermey), in Stanley Kubrick's "Full metal jacket", 1987. (Scene in French. Scène en français. Szene in französischer Sprache. Escena en francés). Ermey was born in Emporia, Kansas, on March 24, 1944, and was raised with his five brothers on a farm outside of Kansas City, Kansas. In 1958, when Ermey was 14, his family left Kansas and moved to Toppenish, Washington. As a teenager, Ermey often got in trouble with the local authorities, and had been arrested twice for criminal mischief by age 17. After his second arrest, a judge gave him a choice between joining the military or being sent to jail; Ermey chose the former. In 1961, at age 17, Ermey enlisted in the United States Marine Corps and went through recruit training at Marine Corps Recruit Depot San Diego, in San Diego, California. For his first few years, he served in the aviation support field, before becoming a drill instructor in India Company, 3rd Recruit Training Battalion, at Marine Corps Recruit Depot San Diego, where he was assigned from 1965 to 1967. Ermey then served in Marine Wing Support Group 17 at Marine Corps Air Station Futenma in Okinawa, Japan. In 1968, he was ordered with MWSG-17 to Vietnam, where he spent 14 months. The remainder of his service was in Okinawa (Japan), where he was advanced to staff sergeant (E-6). He was medically discharged in 1972, because of several injuries incurred during his service. On May 17, 2002, he received an honorary promotion to gunnery sergeant (E-7) by Commandant James L. Jones, becoming the first retiree in the history of the Marines to be promoted. Ermey was cast in his first film while attending the University of Manila in the Philippines, using his G.I. Bill benefits. He played a First Air Cavalry chopper pilot in "Apocalypse Now", doubling as a technical advisor to director Francis Ford Coppola. Ermey then was cast as a Marine drill instructor in Sidney Fury's "Boys In Company C". 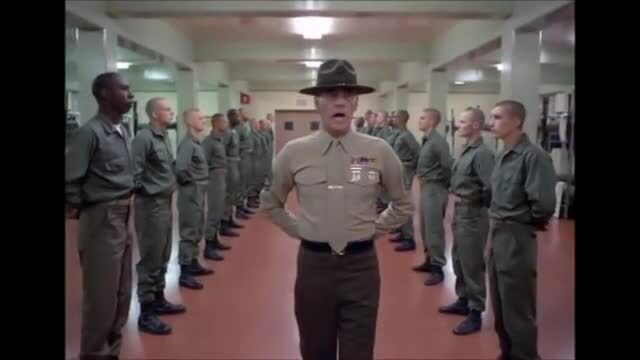 For the next few years, Ermey played a series of minor film roles until 1987 when he was cast as drill instructor "Gunnery Sergeant Hartman" in Stanley Kubrick's "Full Metal Jacket".Seeking absolute military authenticity for the film, Kubrick allowed Ermey to write or edit his own dialogue and improvise on the set. Ermey's performance won critical raves and he was nominated for a Golden Globe Award as Best Supporting Actor. Kubrick later indicated that Ermey was an excellent performer, often needing just two or three takes per scene, a notable rarity in a Kubrick film. Ermey has since appeared in about 60 films and also in several TV shows as well as video games. Ermey has hosted two programs on the History Channel: "Mail Call", and he also hosted "Gunny Time" on the "Outdoor" channel. On December 10, 2010, Ermey criticized the Obama administration's economic policies. In January 2011, Ermey posted an apology on his website, but in spite of his apology, Ermey was "fired" by GEICO, which is owned by noted Obama supporter Warren Buffett's Berkshire Hathaway, with whom he made the 2010 "Drill Sergeant" commercial because of his political beliefs. The insurance giant also removed Ermey's commercial from their official YouTube channel.